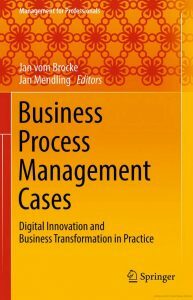 With the new Springer book “Business Process Management Cases – Digital Innovation and Business Transformation in Practice” the editors Prof. Dr. Jan vom Brocke and Prof. Dr. Jan Mendling are presenting the first comprehensive summary of real world BPM cases. We are proud to be part of it with “Managing Environmental Protection processes via BPM at Deutsche Bahn” being one of the 31 cases in this book. This Springer book is the first to present a rich selection of real-world cases on Business Process Management. It reports on best practice as well as lessons learned from organizations that have leveraged Business Process Management (BPM) to innovation and transform their business. With economic and societal sectors of all kinds being challenged by disruptive changes due to digital technologies, in particular, this book shows how process thinking enables organizations to master digital innovation and transformation. The real-world cases presented in this book show how organizations leverage BPM capabilities both for exploitation and exploration in a digital world. The book intends to bring together the experience of organizations using BPM. The focus in neither on academic case studies, nor on offerings from consulting companies. The intent is to learn from the experience organizations using BPM have made. That said, both academic institutions as well as consulting companies may well be involved in the case, but the case has to be developed from the perspective of the BPM-adopting company and the way BPM was used to solve contemporary organizational challenges. The cases provide valuable examples for practice, as well as interesting cases for students. All case descriptions follow a unified schema making the case knowledge easy accessible for readers.